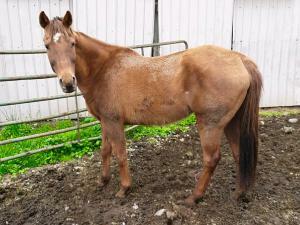 Sunshine is said to be a 3 year old who stands approx 14'2hh. She is said to have been started and has had 30 days of riding. If you are looking for a nice, young spring project please contact Sam. Auction Horses volunteers have not seen this mare in person and these are the only photos we have at this time. 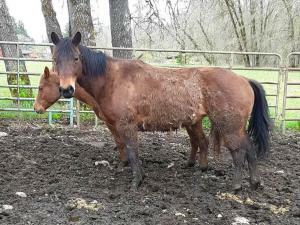 Sweetpea is said to be 9 years old and stands approx 15hh. She is said to be gentle and a nice mannered mare who seems to have a willing attitude and gets along well with the other horses there. No previous history information came with her so we do not know what level of training she has had. She is at least halter broke and friendly. Auction Horses have not seen this mare in person and these are the only photos we have at this time. Please contact Sam to set up a time to meet her or take her home.